The Seekonk S0-48 has a 1/4'' Female Hex Drive, an English range of 0-48 Inch Ounces and torques in both the left and right directions. 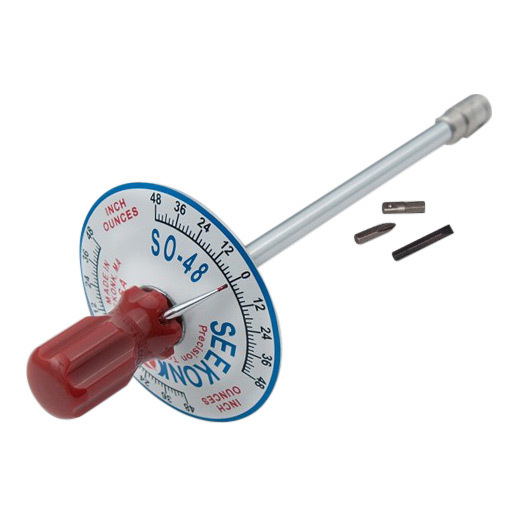 This 1/4" drive vertical torque gauge screwdriver is designed for low torque range tightening in inch grams, inch ounces, and inch pounds. these versatile and dependable tools feature precision thrust and lateral bearings which insure accuracy to within +/- 3%. Ideal for use in electronics, medical, communications, aircraft and automotive industries. Dials designed to minimize parallax error. Three interchangeable bits are provided with every tool (slotted, phillips, and 1/4" square drive); which are accommodated in a standard 1/4" integral hexagonal socket. Conforms to Federal Specification MIL-W-26497B, March 6, 1969. Halo bit, 1/8" ball hex bit also available. Shipped with complementary NIST certificate of calibration. Seekonk Manufacturing Products Warranty: Tools are guaranteed for ninety days with a limited parts and labor warranty. This warranty is void if in the judgement of Seekonk Manufacturing, a tool has been altered or abused. Calibration guaranteed for ninety days. Within that time if it is suspected that the tool is out of specification, we will re-calibrate at no charge. One year manufacturing warranty for tools requiring repair due to manufacturing defect.